WASHINGTON — President Donald Trump‘s former lawyer Michael Cohen will testify next week at a closed hearing of the U.S. House Intelligence Committee after postponing an appearance before another congressional panel, citing threats from Trump. Cohen, who is set to go to prison in March after pleading guilty to crimes including campaign finance violations during Trump‘s 2016 election campaign, had expressed concern about testifying because of threats against his family from Trump. “Mr. Cohen has relayed to the Committee his legitimate concerns for his own safety as well as that of his family, which have been fueled by improper comments made by the President and his lawyer,” Democratic Representative Adam Schiff, the panel’s chairman, said in a statement. “These attacks on Mr. Cohen’s family must stop,” Schiff said. Cohen was subpoenaed last week by the Senate Intelligence Committee to appear in mid-February. Cohen will be represented by a new team of lawyers after shaking up his legal team on Monday. Michael Monico and Barry Spevack, partners in the same Chicago criminal defense law firm, will replace Manhattan attorneys Guy Petrillo and Amy Lester, who oversaw his guilty plea and last month’s sentencing in New York. 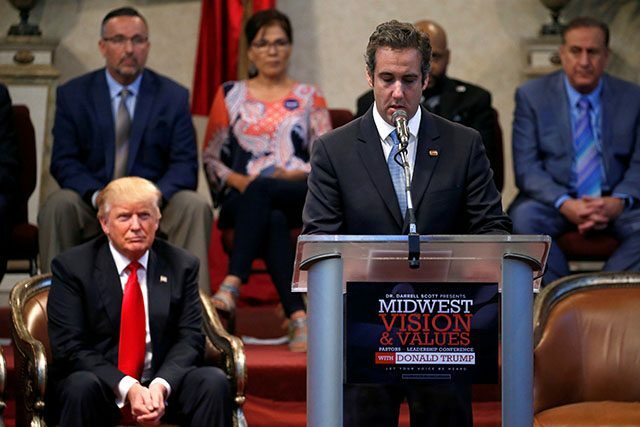 In addition to congressional testimony, Monico and Spevack will also represent Cohen as he cooperates with U.S. Special Counsel Robert Mueller’s probe into Russian meddling in the 2016 election as well as federal and state investigations in New York, Lanny Davis, another Cohen attorney, said in the statement. Trump called Cohen a “rat” in a tweet last month for cooperating with prosecutors. Cohen had been Trump‘s self-described longtime “fixer” and once said he would take a bullet for the New York real estate developer.